It’s not unusual for artists to bare their souls on canvas and in public. What is unusual is for one to do so without pandering or exhibitionism. And in the bargain create a body of work that is pleasing aesthetically and maybe even cathartic. In his new work on canvas and paper called Studio Stories, on display at the Hot Shops Art Center through September, artist James Freeman puts his demons on display couched in symbolism that is challenging, uncomfortable and even disturbing. Studio Stories is very personal work as this mid-career artist examines his muse, his role as an artist and his relative success going forward. But if Freeman is having a mid-life crisis, he largely expresses it successfully, and it’s fairly obvious that he isn’t looking for sympathy or wallowing in self pity. He does, however, indulge a peculiar taste for puppets, clowns, skulls and skeletons, and a headless matriarchal figure who appears to be pulling the strings on the above in several of the surreal scenarios that are the most significant pieces in this rather busy exhibit. 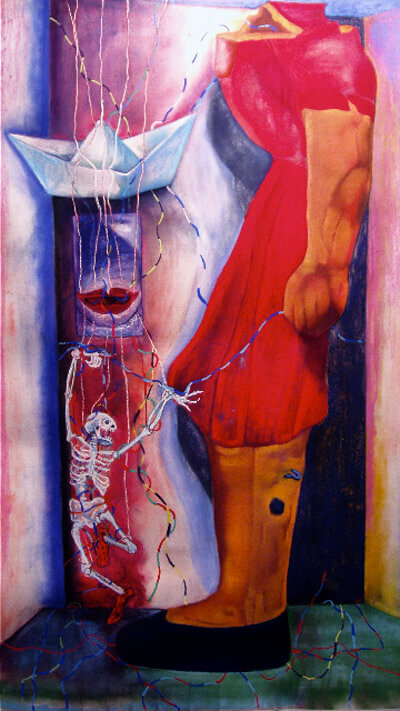 Meaning that once you pass by what may pass for the show’s signature piece, “Dance Fool, Dance,” a rather spectacular skeleton jitterbugging to his master’s tune–the aforementioned matronly torso—the exhibit’s several sets of similar images compete for attention in what can only be described as a carnival atmosphere. Perhaps that circus mayhem that likely attended his process is what Freeman is trying to recreate here, hence the show’s title. Studio Stories is composed of large oil pastels and graphite line drawings that feature “groups of macabre, silly figures…acting out some of the emotional states of the artist…dancing to keep from crying,” according to the show statement. Stand in the center of the 13th Street Gallery and it feels like being in a sideshow mezzanine sampling and anticipating the freak show within mesmerized by the posters on the tent walls. This is particularly true of Freeman’s two best series: four large colorful pastels featuring a Devil in a Blue Dress and her string of fools and jesters; and an eight midsize pencil and charcoal set of group portraits of the above figures. Had these two sets plus three larger acrylic and two or more additional pieces been more judiciously spaced on the four gallery walls, their several visual motifs would have commanded attention on their own 360°. But two added sets, a series of floating eyes and paper-boat hats and a group of sketches are a distraction and give credence to less is more. Nevertheless, Freeman’s body of work here represents one of the more creative, original displays seen this year both aesthetically and conceptually. Granted, submissive skeletons, humiliated clowns and a dominating puppet master may not be everyone’s cup of glee, stopping just short of a fetish fantasy. But Freeman’s vulnerability here has lessons for us all especially when confronting issues of mortality, identity, purpose and self esteem. His vision and POV seem to fall somewhere between resignation and acceptance or delusion and recognition. And the tone varies from the comedy of those who think and the tragedy of those who feel so eloquently expressed by playwright Horace Walpole. In either extreme, the comic and tragic hero in each narrative face their mortality and conclude that yes, all is vanity. But instead of defeat, they put their hubris, indecisiveness and brooding aside and soldier on. Roll the dice, play that cards you’re dealt. Or dance with the Devil in the Blue Dress, Freeman’s most accomplished series in this show. In such works as the subtexted ”Strings Were Pulled” and “When God Tells a Joke,” the blue bedeviled matron must be seen as the artist’s muse. The goddess alternately haunts and manipulates Freeman in his various guises as skeleton or clown. Whether he hates, loves, praises or curses her, all the artist can do is serve her or suffer a worse fate. And even if his muse rewards him he may pay with his soul or sanity. Witness the diminished jester in “Shadow of the Fool” and in the last image in this series, “Notes from the Fool,” a picture of the clown now fills the void left by the headless torso of his muse as if all that remains of the artist is as a figment of her imagination. Or to spin it another way, maybe that’s not a bad thing. Freeman has, in his vision, become one with his muse or at least his art. Isn’t that the way it’s supposed to be? About the art, not the artist? Seen that way regardless of subject, Freeman, whose oeuvre has included botanical abstractions and grid-based collages, is largely at the top of his game in this show aesthetically. He is a master of his expressionistic style and craft here particularly with modeling and proportion that reveal muscle, bone and sinew; the delicate and intricate mark making of facial features, especially eyes and appendages; the dynamic asymmetrical composition and angles that render dominant and submissive relationships. Though admittedly influenced by the expressionism of Jean Michel Basquiat, Freeman’s work is more figurative, especially in the group portraits, including “Anxious, Cautiously Optimistic” and the poignant “The Red Shoes” which rely less on exposition and more upon the mask-like personas of the clown and the skull to reveal more than they conceal of the artist’s psyche. Less convincing are Freeman’s three large acrylics on the north wall, i.e. ”Me in the Year 2080,” that lack the composition and sculptural beauty of his pastel narratives and graphite portraits, truly his media of choice. In the former, the psychodrama seems forced. In the latter, style and subject are unified, suggesting that the best works of his Studio Stories are not only cathartic but a catalyst of even better shows to come.